Stuffed shells are so fun to make! They are easy to change up the flavor and make for an incredible meal. 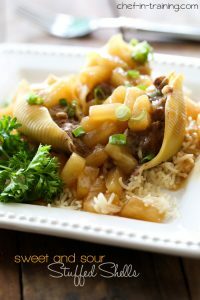 My husband is a huge fan of the sweet and sour flavor and I thought it would be a fun to try and incorporate that in a new meal. This version of stuffed shells offers a variety of flavors and is pretty easy to throw together. It has a great hawaiian flare with each and every bite. 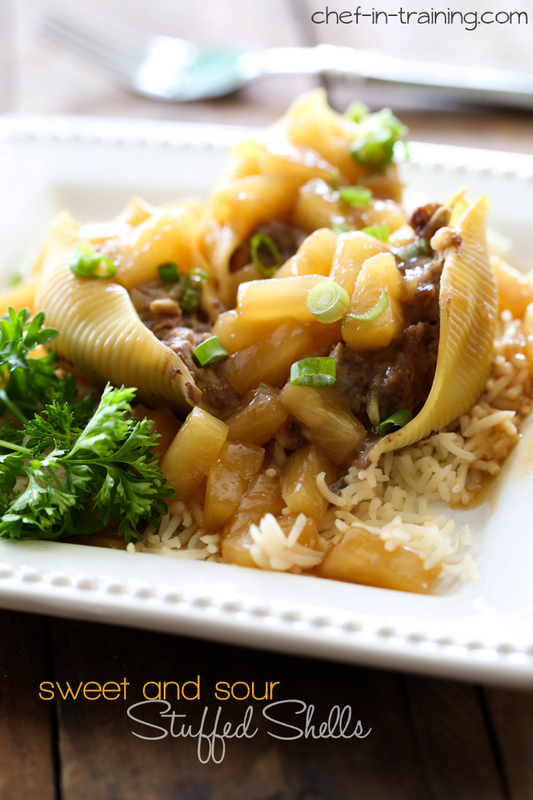 If you need a new meal to add to your family’s dinner rotation, give this a try! This meal is packed with amazing flavor and is pretty simple to put together! Bring water to a boil in large pot of water and dump shells in. Partially cook shells enough to get them open enough to stuff, about 5 to 7 min. While shells are boiling, combine ground beef, bread crumbs, egg, garlic, dry mustard, ginger, salt, pepper and soy sauce in a large bowl. Make sure to incorporate ingredients together evenly. Drain shells and stuff with meat mixture. Make Sweet and sour sauce. Combine cornstarch and water and set aside. In a large sauce pan, bring all sauce ingredients to a boil and slowly add corn starch/water mixture stirring contantly. Continue stirring over medium heat until thickened. Pour sweet and sour sauce over the top of stuffed shells and cover with ¼ cup water. Bake 1 hour at 350 degrees F.
I was just coming to your site to look up pineapple recipes, and lookie there, a post today!! This looks amazing and i love that it is a different twist on stuffed shells! Thanks Nikki and hope the new baby is doing well! I love stuffed shells! Mexican stuffed shells are a favorite in our house. These sounds like a great variation. Pinning! I have a question though. In Step 3, Can I assume that you mean to add 1/4 C water and then cover before baking? Is it ground ginger or fresh ginger? Thank you.